A bit different from the White Chicken Chilis out there, this Chipotle Chicken Chili is a deeply rich, earthy, spicy chili that just happens to have white beans and chicken. And it has a lot more than heat, it has an incredibly complex flavor that tastes like it was slowly simmered for hours. And that’s achieved in about 40 minutes. If you decide to reduce the heat level, start with the lowering the amounts of the different chiles rather than eliminating any of the three chiles in the recipe, the chipotle, jalapeno, and the chili powder. Together, they give such a wide range of flavor and depth to the chili that would be missing otherwise. I adapted this recipe from a recipe by Lucinda Scala Quinn of Mad Hungry (I loved that show!) 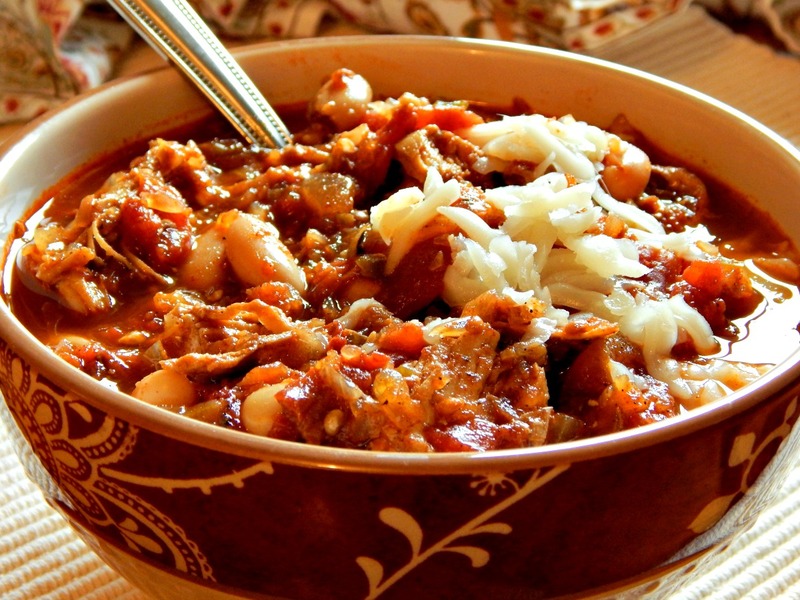 she called Hearty Chicken Chili and both fabulously “frugalized” it and streamlined a bit to make it a little straightforward and a bit do-able. Actually, now that I am going back and looking at the original, I made quite a few changes in it! What I didn’t change though, was the flavoring. What I wish I would have kept are the little cornbread croutons. Oh well, next time! First of all, I always double the recipe for Chipotle Chicken Chili and sometimes make a lot more! This recipe as written makes a little over six cups, which is a bowl for four people, about a cup and a half each. That’s not going to go far in my family and def isn’t enough for a party! Besides, any Chili tastes better the next day and any Chili is a great candidate for making a larger batch and freezing for a later meal. Besides, this is so good, I can’t bear the thought of no leftovers. Watch the heat on your pan as you’re searing the chicken; too hot and you’ll burn all the fond (the lovely little browned bits on the bottom of the pan) and that gives so much flavor to the Chipotle Chicken Chili. Watch the spices, too, as you toss them into the heat. That will wake up the flavors of spices, but be ready to add in the rest of the ingredients as soon as those spices become fragrant. Use a SPOON instead of a knife to clean ribs from ANY pepper. This Chili can easily be stretched by adding another can or more beans and maybe just a bit more broth. The lowly bean is one of the healthiest foods you can eat – eating beans regularly basically eliminates the issues so commonly known. Dried beans are so inexpensive to start with that they are seldom advertised as being on “sale,” but they often are after any Holiday in which Ham is usually served. If you’re used to buying canned beans, unless a 15 ounce can is less than 26 cents with sales and coupons, they are more than the 79 cent per pound price of dried at Aldi. A fifteen-ounce can is about 1 1/2 cups of beans, and a pound is roughly the equivalent of 3 cans. Never buy full price chicken – it goes on sale too often. Stock up and break down larger packs in sizes your family can use. It really pays to make your own Chicken Stock with bones and scraps, but if you don’t buy your stock during the glut of sales over the Winter Holidays and around Easter. Cans of Chipotle Chilis are often on sale unadvertised, and usually at a low during Cinco de Mayo. Once a can is opened, just put the rest in a Ziploc and freeze. They don’t freeze totally hard and can be chopped right from the frozen state. Drain tomatoes, reserving liquid. Preheat broiler rack three inches from heat source. Arrange jalapeno, onion, and garlic, cut side down on a rimmed baking sheet, lined with foil for easy cleanup. Broil until starting to char, about 10 minutes, remove. Chop onion and mince jalapeno and garlic. Set aside. Add oil to a large, heavy Dutch oven (preferably enamel cast-iron) and place over medium-high heat. Add chicken and allow to sear before stirring, five to six minutes, then remove to a plate. Work in batches if necessary. Reduce heat to medium and add onion mixture. Cook, stirring now and then until golden brown. Push aside onion mixture and add chili powder and salt, stirring until it is fragrant and begins to darken, about a minute. Stir in chipotle and chicken, raise heat to medium-high and add tomatoes, stirring to loosen darkened bits on the bottom of the pan. Stir in the stock and cook for about 20 minutes at a simmer. Add beans and simmer until heated through about 10 more minutes. Serve with desired toppings, and/or cornbread. Nutrition: Per Serving (excluding unknown items): 277 Calories; 10g Fat (31.4% calories from fat); 23g Protein; 24g Carbohydrate; 7g Dietary Fiber; 55mg Cholesterol; 973mg Sodium. Exchanges: 1 Grain(Starch); 2 1/2 Lean Meat; 1 1/2 Vegetable; 1/2 Fat. White Chicken Chili made September 2011 and priced at $2.43; remade July 2014 for $3.72. This entry was posted in Click here for Bargain Meals, Click here for Fabulous Food Posts and tagged Beans, Chicken, Chili, Chipotle, Freezes Well, Mad Hungry, planned leftovers, Soup, white chicken chili. Bookmark the permalink.